Welcome to Emerald Pools, your premier locally-owned pool contractor serving Dallas and the surrounding areas. Since opening Emerald Pools 20 years ago, owner Cliff Bechtold remains dedicated to putting his clients first – whether it’s by designing and building unique, custom inground gunite poolscapes that stand out or providing superior customer service and one-on-one attention that can’t be found elsewhere. At Emerald Pools, you get what you pay for. We design and build custom gunite pools and poolscapes utilizing Hayward’s state-of-the-art equipment technology and energy-saving features. We can accommodate any personal dream or build an architect’s vision working with you throughout the entire process. Incorporating a pool into your backyard is a big investment, and there’s no bigger advocate for that investment than Cliff Bechtold and Emerald Pools. There’s an art to superb pool design, and Cliff values being able to capture every minute detail looking to be included. Each pool is hand designed in an effort to portray the pool’s distinctive appearance. If you’re looking to just incorporate a pool or are wanting something more grand, such as an entire outdoor living oasis, Cliff can and will bring your vision to life. Once construction begins, your backyard couldn’t be in better hands. Unlike many pool builders who rarely step foot on the construction site, you’re in reliable and capable hands with Emerald Pools. We guarantee you’ll be kept up-to-date on a daily basis, staying in the know with scheduling and construction updates. Your project matters to us, and that’s why Cliff personally supervises and approves all work completed. Emerald Pools also offers exclusive personalized pool service to our clients once you’re pool is completed. We know your pool better than anyone, which is why we want to make sure it always operates effectively and efficiently. Your time is best spent swimming in the water rather than caring for it. Emerald Pools is your personal pool builder. Learn More We take pride in the efficiency in which we construct our pools and look forward to bringing our expertise to your backyard. Learn More We offer top-quality materials, the finest craftsmanship, and the care and attention to detail that you deserve. Learn More Water features can bring a whole new dimension to your backyard pool. Learn More Enhance the enjoyment of your new pool and spa with a variety of additional offerings. 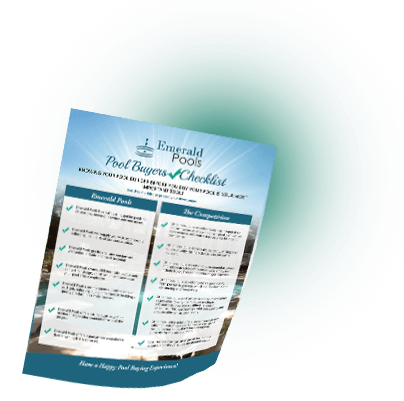 Learn how Emerald Pools compares to the competition and is the perfect pool builder for you with this free downloadable checklist. As a first time pool owner both my husband and I were very nervous committing to a company building our pool. It's been over a year since you completed our pool and we wanted to thank you all for your hardwork. Nora F. & Mark G.
Stay up to date with announcements and information about Emerald Pools. We are confident in our quality materials and level of craftsmanship, and fully guarantee all work completed. Take a video tour of our display pool to see just a few of the custom pool features we can build for you. Emerald Pools proudly serves Dallas, Frisco, Collin County and the surrounding areas. Website Designed by Small Screen Producer.